The Senate Intelligence Committee investigating Russian interference in the 2016 presidential election has asked Wikileaks founder Julian Assange to testify, the website announced in a tweet Wednesday. According to Wikileaks, the committee made its request in an Aug. 1 letter delivered to Assange at the Ecuadoran Embassy in London, where he has lived for almost six years since being granted asylum. "As part of that inquiry, the Committee requests that you make yourself available for a closed interview with bipartisan Committee staff at a mutually agreeable time and location," the committee wrote, according to a letter posted to Twitter by Wikileaks. Assange's lawyers said they are "considering the offer but testimony must conform to a high ethical standard," according to Wikileaks. Representatives for the top Republican and Democrat on the Intelligence Committee declined to comment on the letter. It would be difficult for Assange to testify, even if he agreed to it. In March, Ecuador cut off his ability to make calls, use computers or receive visitors other than his lawyers in London, such as Jennifer Robinson, who told ABC News on Friday that his health has declined in conditions she likened to "solitary confinement." Cutting off his voice to the world was punishment for tweets that meddled in foreign politics, Ecuadorian officials have claimed. Robinson said she fears that if Assange loses his asylum -- as she and other Wikileaks supporters have heard rumors will happen -- he will be arrested on the spot by British authorities and handed over to American law enforcement officials. It is not known whether any charges are under seal in the U.S. against Assange, who has published tens of thousands of filched military and intelligence agencies' documents and diplomatic cables. But two senior national security officials told ABC News in the last two weeks that American law enforcement officials "want to get their hands on Assange." Wikileaks' alleged role in the 2016 presidential campaign was referred to in a federal grand jury indictment that special counsel Robert Mueller secured last month of 12 Russian intelligence officers for allegedly hacking Democrats' emails. Mueller is probing Russian interference operations aimed at the U.S. election. During the campaign, Wikileaks published emails hacked and stolen from Hillary Clinton's 2016 presidential campaign manager John Podesta and documents from the Democratic Congressional Campaign Committee and Democratic National Committee. Some of the hacked emails were first published on the "DCleaks" website, which Mueller alleges was a front for Russian military intelligence, known as the GRU. Assange has lived in the London embassy since 2012, claiming diplomatic asylum, after violating the terms of his bail agreement related to sexual-assault charges in Sweden, which have since been dropped. 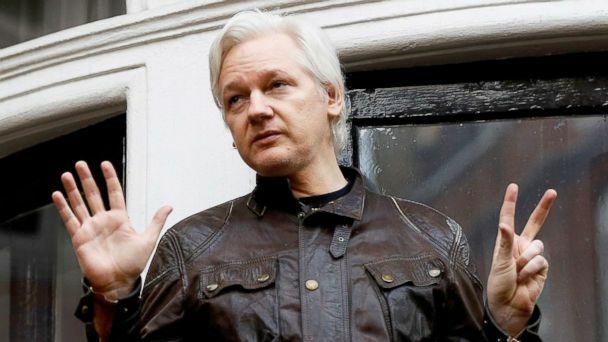 "Our concern is and has always been the risk of extradition to the United States," Assange's lawyer, Jennifer Robinson, told ABC News in an interview Friday. Assange has denied receiving the hacked emails from the Russian state.